Our arquebus moment – Andrew James Taggart, Practical Philosopher, Ph.D.
A philosophical review of Saul Frampton’s When I Am Playing With My Cat, How Do I Know that She Is Not Playing with Me? 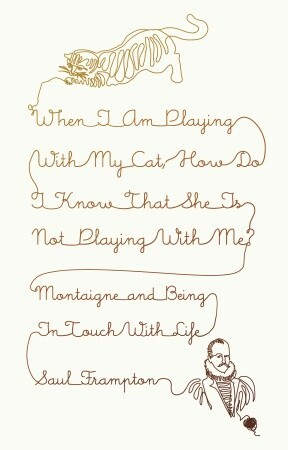 Montaigne and Being in Touch with Life (New York: Random House, 2011). The rending of man from nature first came with the flood. Before that, one must imagine a time of amity, friendliness, and trust, nature evoking more awe than fear, more mystery than hostility, more love than strife. Yet after, with the flood there came a “disbelief in nature,” writes Hegel, a time of vulnerability giving way to man’s desire for mastery. And so he builds a tower impregnable to sea fury, and also seeks protection from a being who, now being his master, makes nature his servant. And thus man’s wounds do not heal, his estrangement becomes permanent, yet each day he grows stronger in thought, more cunning in deed. Thereby does he create tools to yoke nature to his purpose. When it was fired, the arquebus must have been so loud as to rattle the graves, the smoke so dense as to shroud the scene in fog. “The hargabush dims the ayre with misty smokes,” wrote one observer in 1557. Less accurate than the crossbow but more easily reloaded, less powerful than the cannon but more mobile and nimble, the arquebus revolutionized the art of war, inaugurating an age where numbers, chance, and strategy would trump skill, virtue, and nobility. armies greatly expanded: the standing French army grew from 50,000 in the mid-sixteenth century, to 80,000 after the Wars of Religion, to more than 100,000 by the 1630s. And with it warfare became a more bureaucratic and logical exercise, with a greater emphasis on sieges and fortifications. This was not all, however, not by a long shot. The sheer randomness of arquebus fire, represented by a figure who, in Hans von Gersdorff’s Fieldbook of Wound Surgery (1528), is killed humanely by swords and knives but mutilated grotesquely by arquebus shot and cannonballs, suggested to Montaigne that action and reaction, cause and effect, prudence and insight had come unglued and also that natural justice might be no more than a pretty ruse of Fortune. The arquebus, let’s say, is the name for this painful passage to modernity. The sixteenth century, as Frampton means to show, was a long period of great unraveling, an arquebus writ large. First there was the Reformation, a spiritual crisis so difficult for us to fathom yet so great in its implications that it provoked Descartes to retire to a room of his own and there to conjure up the most indubitable first principle upon which the modern world might stand and stand firm. Then there were the French Wars of Religion (1562-98), more a stitched-together set of stops and starts than one continuous civil war, a set of conflicts that pitted neighbor against neighbor and Huguenot against Catholic. Depending on which scholar you ask, Montaigne, whose mother had been a converso Jew who’d fled the Spanish Inquisition, was either nominally Catholic or Catholic by custom or a skeptic by choice or a diplomat by training, yet, whoever he was, he was nonetheless surrounded by Protestants in Bordeaux and by zealots everywhere else. Then there were the constant sieges on and doubts about political authority such that it must have occurred to some that the Divine Right of Kings might not be so divine after all or, in any case, that the principle of succession was not woven into the fabric of nature. Finally, and no less unsteadying, the Plague lingered on well past the end of the Middle Ages and, as Frampton makes clear, it was common for the nobility to pull up stakes when word arrived that an outbreak was near. (The poor stayed put and prayed.) Among the Plague’s victims was Montaigne’s philosophical friend, Étienne de La Boétie, a young man of excellent learning whose death would change Montaigne’s life for good. Individually, these events were tragic, but collectively they were epoch-shifting inasmuch as they intimated a thoroughgoing loss of social trust. What Frampton says of civil war could also apply to matters of religion and politics more broadly. The war “results in not only the breakdown of society but a breakdown of trust—Montaigne fearing his own side almost as much as his enemy.” Or again: “the natural bonds between people are severed by civil war—the ‘divisions and subdivisions’ which threaten to tear his country apart—rendering them incapable and indeed scornful of sympathy and fellow feeling.” Or again: the bonds between men were “progressively anaesthetized by the political and religious violence of his time.” The loss of social trust, so key, according to Fukuyama, to a well-functioning civil society and so fundamentally absent in Afghanistan and the former Yugoslavia, leads to wide-scale divisiveness as well as to a sense of social alienation. For how can I see myself fitting into this social world when it repels and repulses me? Gallows humor would have been little consolation, and tragic drama ought, in spirit, to have been the order of the day. It follows that all were philosophers in the making: few actually but most potentially. This was because the first-order loss of social trust entailed second-order philosophical questions concerning the “problem of the criterion.” The eminent scholar Richard Popkin, in his marvelous The History of Scepticism, has shown that ancient skepticism reappeared in Renaissance Europe only after the Reformation had thrown the criterion for knowing the divine into doubt. Was the Church the ultimate authority on the Word of God, or could an individual, with German Bible in hand, reach divine truth through her own searching and by her own path? Then too the problem of the criterion could not be so summarily dismissed or answered—hence war was the “logical consequence” of or the “reaction formation” to steely dogmatism—nor its ramifications so completely localized to matters religious. As a result, doubt concerning how we know what we know not only supervened on the loss of social trust but also spread into the deepest corners of social life. This man—was he a friend or a foe? A neighbor or a stranger? To welcome or shutter? To love him or let die? Montaigne reports that passers-by leave a man to die bleeding along the road for fear of incurring the byzantine and absurd wrath of the law. It is here that stoicism and skepticism strongly influence Montaigne’s early philosophy of life. Consider stoicism first. If life has become unfriendly and society inhospitable, then the purity of thought, what the ancient scholar Pierre Hadot has called the “inner citadel,” promises retreat and constancy. Stoicism is the most beautiful philosophy of the fallout shelter, the quickest remedy for the arquebus, the shortest path to invulnerability in the face of misfortune, death, and disease. How beautiful that even as the world burns I can be free. It is something of a surprise, then, that Frampton could be so harsh and uncharitable to stoicism. Has he never been to New York? Has he never felt the desire for constancy amid the play of transience? He thus likens stoicism to a philosophy of death, an ars moriendi, an unsuccessful parlor trick: to save the brain, we must surgically remove it from the body. Thus suspended, “thought is absolutely distanced from its embodiment,” here “where constancy and incorrigibility coincide” and also where the Cartesian philosophy—to wit, that failed escape route—is most at home. Under the stoical dispensation, there is “nothing to be gained by desperately hanging on to life,” nothing, that is, but the consolation of skulls. The coldness of the world is thereby redoubled, even as it is anesthetized, in the coldness of thought. What Frampton fails to recognize, though, is that there is freedom in this, and, as a moment in consciousness, stoicism has its rightful place and its appropriate time. We come back to stoicism after we’ve been wounded; the reprieve can be nourishing. But only for a time and certainly not for good: Frampton is right that stoicism cannot have the final word on living or living well. Skepticism, also one step removed from the dalliance of life, nevertheless engages with and works on it more closely. Many of Montaigne’s citations, vignettes, anecdotes, and exempla suggest that individual objects, to say nothing of individual characters, are irreducibly complex and hence do not admit of easy categorization. Besides, Montaigne observes, our perception is limited, and our reasoning cramped, and so we must be content with exercising our judgment on the fly and with recognizing our fallibility concerning all things sublunary. What’s more, Montaigne’s essay on cannibalism and his travel journals, to mention but two, are really extended skeptical arguments from custom according to which “When in Rome…” reigns supreme and humility the stated aim. Caute (caution) was one of Spinoza’s favorite mottos; que sçais-je? (what do I know?) was Montaigne’s. When I read Montaigne’s sentences, I imagine a “perhaps” in place of a period at the end of nearly ever sentence. In his essay ‘Of Cripples’, in many ways a vehicle for his skepticism about witchcraft, he says that ‘the witches in my neighbourhood are in danger for their lives when some new author appears whose opinion gives a body to their fancies.’ He thus clearly sees the way the traditional folk belief provided the raw material for demonological interpretation, and goes on to warn of the danger of using biblical sanction (‘Thou shalt not suffer a witch to live’) to support the deranged tales provided by witnesses, ‘whether in giving evidence against another or against themselves’. That is to say, we should be mistrustful of confessions as much as accusations. Montaigne’s skepticism is… opportunistic rather than schematic; less a dogmatic denial of knowledge (which itself smacks of presumption), and more a resistance to the inquisitorial mindset that characterized sixteenth-century intellectual life. Montaigne’s philosophy of life is not, then, a thoroughgoing rejection of all claims to knowledge but, thinks Frampton, a desire to put us back in touch with “tangible objects,” a desire to reintroduce trust into the handshake and love into the face-to-face. We might say that skepticism is a path to intellectual and moral maturity. If stoicism is a retreat from, rather than a rendezvous with, the living, then skepticism, more gingerly but also more tepidly, seems to get close to without putting its finger on living. Both, in being once removed, cannot be the basis for Montaigne’s mature philosophy, a philosophy of “proxemic beholdenness” whose highest purpose is to overcome the sense of distrust cast over the modern world. That is, if second-order questions lead unwittingly to a dead end, then perhaps we’d do well to try the reverse course: we could try out approaching life, touching it, and loving it for what it is. I can’t help but be moved by Frampton’s reading of a fully embodied Montaigne who, in Frampton’s soft prose, becomes the most tactile, homey, and fleshly of philosophers. More than this, I can’t help but love Frampton’s Montaigne in whose hands life comes ever nearer and stays for a while. Proxemics is the clumsy, lumbering name for the science of physical space, and kinesis is the slightly more palatable one for the study of gesture and movement. To develop his proxemic account of Montaigne’s philosophy, Frampton draws on the work of the Japanese philosopher Tetsuro Watsuji who describes relationships physically, psychologically, and spiritually in terms of their “betweenness.” Here, one thinks of Anne Bradstreet’s loving depiction of her absent husband—“My head, my heart, mine eyes, my life, nay more,” my dear husband—as very close to Frampton’s project of poetic redescription. But redescription in what sense? Let’s say that Frampton’s project can be analyzed in three parts. First, he aims to redescribe self-knowledge not in terms of ascent but in terms of self-acquaintance. Montaigne the vintner essays himself, getting “closer to himself” through “self-tasting,” through “evolving acquaintance” or self-accompaniment. When I approach myself, I stroll about, I take my time, and (why not?) I seduce myself. Had Montaigne lived today, he might have written some fine list poems. In “Of Experience,” for instance, he acquaints himself—and us—with all the myriad vicissitudes of taste, his dietary regime, his sense of ageing, his various temperaments and temperatures and moods, his sicknesses and rhythms, his understanding of medicine and medicine’s lack of understanding of health, and, not the least and perhaps the part I like best, his morning crap. So, Montaigne takes seriously the idea of mulling over his ownmost, evolving self in the slowness afforded him by leisure and experience. But then self-acquaintance is at one with beholdenness to others. This is the second “sphere” of Frampton’s account. We might imagine civil society, normatively understood, as the beautiful drama in which friendliness and neighborliness unfold. And what would this world look like but a pained reaction to cruelty (“nothing provokes my tears but tears,” says Montaigne), a profound weightiness before another (here, brother, have mine), an attuned perception to need (come, please, sit down and eat), a desire for the kind of conversation where the lines of the face bespeak amiability, and, above all, a deep trust in the words and deeds of others. Frampton concludes, “[I]t is through our gestures and the ‘freedom and firmness’ of our speech that this trust is to be re-affirmed.” In civil society so understood, promises would mean something, gifts would flow freely, and payment would be a sign of gratitude. I envision the magnanimity of spirit so full as to require something like marriage, this being the most intimate sphere of life. And such plenitude, naturally, would have to fulfill itself in the begetting and raising of children. We know, however, that Montaigne’s relationship with his wife and his mother were anything but and that many of his children died while young. It’s sad, really. No doubt, as Frampton relates, Montaigne fulfilled his familial duties, but then retiring to his tower to write would not have been enough for a fully realized proxemic philosophy of life. Marriage, the harmony of concrete individuals and abstract institution, would have to be the scene where eros—affection but also duty, pleasure but also responsibility, education but also appreciation—abounds. Hands, tongues, words, warmth, recognition, reassurance, compassion, caresses: all deep forms of yes’s, all forms evidently not fully embodied in Montaigne. And this begs the larger question: though I love Frampton’s conception, though I conceive of our world, which is now passing through our own arquebus moment with collapsing institutions and nihilism regnant, redeemed and transformed, is it not too much an idea to be a social reality, too much Plato and not enough Aristotle? For if the bond of trust between man and woman, friend and neighbor, citizen and immigrant has been broken, then can spirit on its own redeem us? I don’t deny that Frampton’s is a marvelous re-enchantment of the modern world nor that it is a welcome thickening of the bonds between neighbors and friends nor that it is a loving statement of the soul’s re-acquaintance with itself, its other, and its beloved, but then I’m not sure whether such a philosophy of life can be lived today. I read this line and this page and think, Yes. Yes, my friend. Yes. But then the perhaps, the lonely doubt, the sense that self-transformation requires world transformation starts breaking through. The antinomy between the spiritual path of reorientation, one sought by mystics, gnostics, and ascetics, and the political path of reform returns unanswered, unmoved, uncowed. For if the aim of education is now ambition, what then of the common good? And if the aim of living is production or reproduction or sheer busyness, then what of self-acquaintance cultivated through leisure? And if the substance of the family is now comfort and stability, what then of eros, of touching and begetting? And if civil society has been coarsened by social media and fattened by acquisitiveness, what then of togetherness, friendliness, and beholdenness? And if the aim of the state is now… Or shall I find the glass of wine and our fine words to be enough? I don’t really know. I feel this too, I feel it completely as I close my eyes on the inhumane subway. Ah, love, come inside now; it’s getting late on this vast darkling plain.